With digital cinema conversion completed in most of the world, this year the IBC Big Screen Experience (running 12-15 September in Amsterdam’s RAI) has be re-vamped extensively to focus on the latest issues facing the industry. Sessions such as EDCF have been moved from their traditional slot (now Sunday evening, followed by drinks) and new areas of coverage introduced. Celluloid Junkie caught up with industry veteran Julian Pinn (founder and consultant for Julian Pinn Ltd) who is the Executive Producer for this year’s Big Screen conference, to ask him what those planning to attend should make room for in their no-doubt packed IBC diaries. Celluloid Junkie: This is the first year that IBC’s Big Screen conference stream is free to all attendees of the show, what’s behind this change? 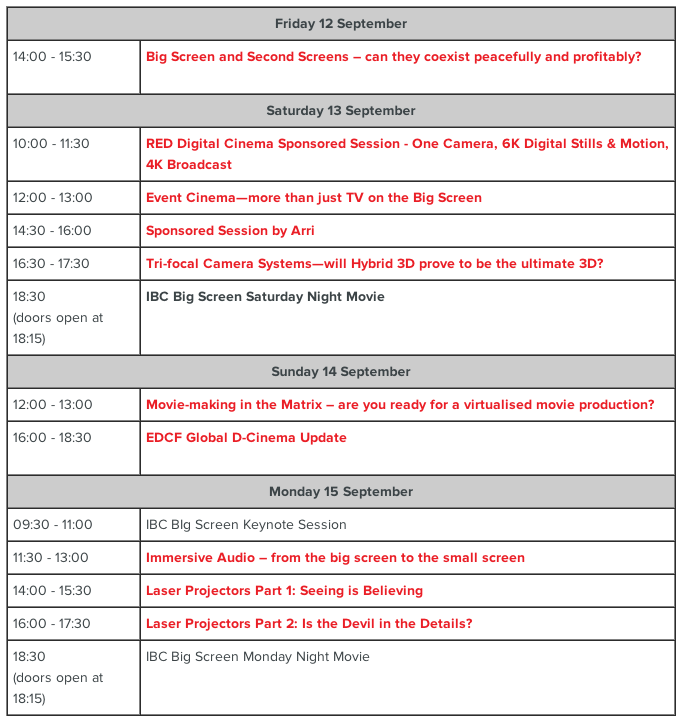 Julian Pinn: For IBC registered delegates, the IBC Big Screen Experience is indeed a free-to-attend programme of carefully curated, editorially lead conference sessions, exhibitor product demonstrations, and Big Screen movies. The minimum IBC registration one needs to gain access to the Big Screen Experience is an Exhibition Visitor Pass, which itself is free if booked before 21 August 2014. This is an initiative by IBC to add value to the overall IBC experience and to remove barriers and complexity to those who are looking to make the most out of their busy schedule during the entirety of IBC2014. CJ: Is there a theme running through all the sessions? – disruption due to the new entrants, new commercial realities, and new ways of doing business not only within the cinema business but within the wider industry from big screen to small screens. CJ: What new issues and topics will be discussed at this year’s Big Screen? JP: Not a quick answer I’m happy to say! The conference kicks off this year on Friday afternoon when we will be asking for the first time if the Big Screen and Second Screens can coexist peacefully and profitably—experiencing first-hand the technologies from Shazam and Cinime. Saturday will feature a mixture of sponsored sessions, from Red and ARRI, with a couple of editorial sessions new to IBC in recent years. The first is on Event Cinema—a new sector to the business that is predicted to grow to 5% of the overall global cinema box office by 2015; we will be seeing examples and discussing important questions about the challenges of merging the two disciplines of broadcast and cinema from technological, artistic, and commercial perspectives. The second is on a recent innovation, the Trifocal Camera System, that aims to offer cost and quality advantages to producing 3D movies by cleverly merging the advantages of 2D production with powerful 2D-3D conversion that is controlled by real depth data captured during the very shoot. Otherwise known as Hybrid 3D, we will be seeing examples of this interesting new work. Sunday moves us to Room E102 (whilst the Big Screen is being prepared for the IBC Awards show that evening) where, in the morning, we will discuss the virtues of a virtualised movie production workflow: what are the implications of working in the cloud? A large part of the afternoon is dedicate to the European Digital Cinema Forum Global Cinema Update, which offers an impressive line-up of industry specialists bringing us up to speed with the latest business and technology developments in digital cinema around the world, plus a post-session networking event. Back to the Big Screen itself for Monday’s finale that will be focussing on the specially-installed 40+ loudspeaker Dolby Atmos immersive audio system powered by QSC and the 6p 100,000+ Lumens laser projection system from Christie that is able to produce high quality 14 fL full brightness Dolby 3D. In the morning, we will be hearing from Dolby, Barco, Auro, and DTS on their immersive audio solutions for cinema, broadcast, home cinema and mobile—arguably the most disruptive advancement since 5.1 in how we experience sound. The afternoon is dedicated to a two-parter special on laser projection. This SMPTE / IBC co-produced session will dig deep and wide into the go-to-market status including regulatory and commercial viability aspects, into the potential quality benefits of wide-gamut colour and extended dynamic range, and into the practical aspects of reducing speckle and other artefacts specific to laser illumination. Most importantly, this session will include a breath-taking demonstration using the IBC2014 Big Screen Experience 6-Primary laser projection system from Christie. CJ: This year’s Big Screen keynote is by Douglas Trumbull. What prompted IBC to pick him? JP: We’re very excited about having Douglas Trumbull as our keynote as he is a perfect example of someone who, over his five decades of pioneering work, has positively disrupted the status quo in advancing each of those key themes: art, science and business. Trumbull is the Academy Award winner whose visual effects credits include ‘2001: A Space Odyssey’, ‘Close Encounters of the Third Kind’, ‘Star Trek: The Motion Picture’, and ‘Blade Runner’. Trumbull is also a writer and director (‘Silent Running’, ‘Brainstorm’, ‘Back to the Future – The Ride’) and is adept at integrating directorial and story-telling aspects to immersive cinema language. Forever pushing the technical boundaries of artistic immersion, he developed the Showscan® process for 60 fps 70 mm cinematography which delivered imagery onto the cinema screen that was said to be indistinguishable from reality. Now firmly in the digital era, Trumbull’s current vision is manifested in his new process, MAGI, which explores a new cinematic language that invites the audience to experience a powerful sense of immersion and impact that is not possible using conventional 24 fps or 2D cinema technology. At IBC, Trumbull will not only tie together the disruptive themes of the conference sessions throughout the four days, but he will make full use of the IBC Big Screen itself by showcasing—in 120 fps 14 fL Dolby 3D, Christie 6p laser, and Dolby Atmos—his short sci-fi adventure, UFOTOG, which is a fully dramatic story that explores this new medium as a creative palette. This is a must-attend keynote for those needing to keep an eye and ear on the next generation quality of electronic entertainment—both big screen and small; how advances in technology unlock new artistry; and how commercial realities can be navigated as we consider the future of the medium. An IBC first, this promises to be an amazing unmissable taste of the future. CJ: The Saturday and Monday film screenings have become a fixture of IBC’s Big Screen; what’s special about what you are showing this year? JP: We are indebted to our studio friends who each and every year support IBC with access to high value feature film content that are selected to both entertain and to inform the IBC audience by showcasing films that relate in some way to the key themes of the conference. This year we acknowledge the generosity and assistance of 20th Century Fox for making two films available for these special screening for IBC delegates. A world-first: IBC is offering an exclusive presentation, free to all delegates, of full 14 fL brightness Christie 6p laser projection, Dolby 3D, and Dolby Atmos immersive audio of two major blockbusters on Saturday and Monday evenings. 20th Century Fox’s multi-Academy Award winning ‘Life Of Pi’ (Saturday) is praised as one of the best stereoscopic films of recent years, while ‘Dawn Of The Planet Of The Apes’ (Monday) is this summer’s breakout hit. Both films have been re-mastered for high brightness, 14 foot-Lamberts stereoscopic 3D—taking full advantage of Christie’s 6-primary DLP laser illuminated projector. Both also feature Dolby Atmos, the next generation immersive audio system from Dolby Laboratories, using 40+ QSC speakers specially installed in the RAI Auditorium. We are really excited that this will be the first time any audience in the world will get to experience a full-length feature film in full brightness 3D laser projection together with the immersive audio of Dolby Atmos. Courtesy of Christie, Dolby Labs, QSC and 20th Century Fox, these really are exclusive must-attend nights for all IBC delegates. CJ: Is IBC trying to steal the audience from the likes of CineEurope and why should creatives or exhibitors attend the show? JP: No, not to steal but to offer something in addition to what the classic cinema shows typically offer. The IBC Big Screen conference is able to tap in to the confluence of what have hitherto been the rather separate disciplines of broadcast and cinema and to act as an important international forum for a wide range of industry technologists, strategists and executive leaders to fully understand and thus navigate the wider inter-related industry from Big Screen to Small and from Content Creation to Consumption. This year we are offering a rich, free- of-charge, programme that considers in detail the salient topics of the wider industry from the perspectives of art, science and commerce. We believe it to be a must-attend event for: content creators, distributors, cinema owners, broadcasters, mobile operators, journalists, manufacturers, and innovators – to name but a few. CJ: Finally, are there any questions or topics that are particularly close to your heart? JP: My particular passion is around the successful advancements of the art, science and commerce of the medium. How can we innovate in a commercially-viable way that gives more power to the content creators in moving their audience in a more emotive and thus more valuable way? Every element in the chain must be optimised and that means the members of the entire ecosystem must be in tune with each others’ needs and issues. This is why attending an event such as the IBC Big Screen conference is critical in order to learn vital insights into how best to shape your company’s future role in such a vibrant and complex industry as is ours. I would also like to take this opportunity to express my sincere thanks to my IBC Big Screen committee members and session producers who have tirelessly worked over the past months to bring this conference together. More information can be found about those producers, all the speakers, and the rest of IBC2014 by exploring www.ibc.org. CJ: Thank you for talking to us and we should finish by mentioning that Celluloid Junkie is media partner of IBC and will be bringing our readers coverage from all the Big Screen Experience sessions, as well as from IBC in general.